Offering you a complete choice of products which include E-Excise Software. From the day of our establishment, we have been successfully catering the requirements of our clients by providing billtrace e-excise software solutions for bar & wine shops. the aim of our enterprise is to provide simple yet innovative solutions, which enable us to attain utmost client satisfaction. 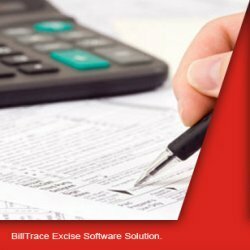 This software is extensively demanded in bars and restaurants to estimate their taxes and duties amount. With the help of this software, our clients can improvise their calculation techniques.